Small spaces are underrated. There’s something special about living in a small, quaint home. Decorating an area where you’re limited for space allows you to focus on function. You’re forced to think about the practicality of the space and to decorate only with items that you really love. The thought of fitting all of your decor into a small room can be intimidating, but it doesn’t have to be. If you’re pressed for space it does not mean that your home can’t be unique and fabulous. With just a few helpful tips, your small space can be beautiful, functional, and comfortable. Let's start by breaking down some myths. Living in a small space doesn’t mean that you have to avoid using bright paint colors, or that you can't accent your rooms with bold wallpaper. It’s all about creating balance. Splash your favorite bright shade on the wall and create balance by adding a few simple pieces. Try throwing in some sleek picture frames, or neutral furniture to create balance. Light is an essential part of any living space, but it’s even more important to have good lighting when living in a small space. Ensuring that your tiny area is adequately lit will help your home feel more open, breathable, and livable. Natural light is the most ideal, but if that’s not available, try adding good overhead lighting as well as a couple of table or floor lamps for ambiance. Mirrors are one of the best ways to make a room feel larger and more open. Adding a large wall or floor mirror to your living room or bedrooms creates the illusion that the space is bigger than it really is. 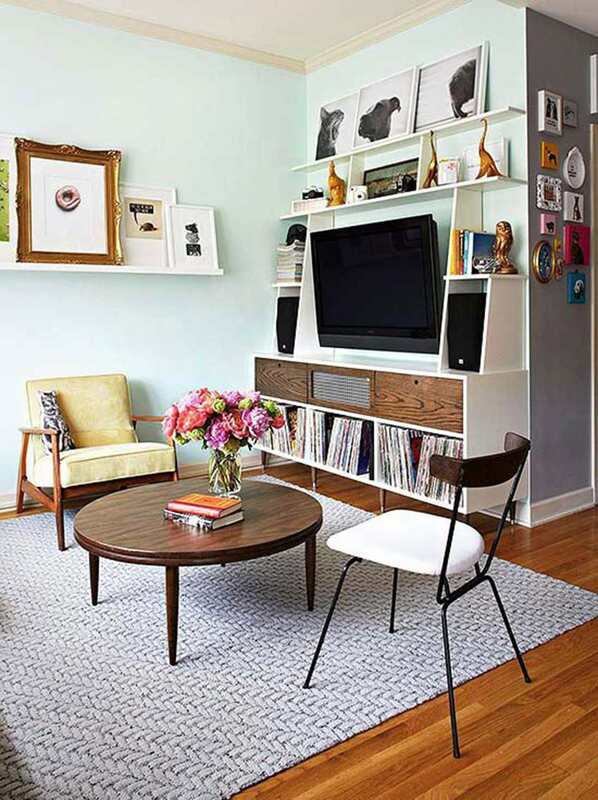 A focal point in a small living space allows a room to feel more put together. Having a lot of small features within a room and no focal point can leave a space feeling cluttered and disorganized. Try adding a gallery wall, or hanging a large piece of art. This will draw your eye to the desired focal area and bring less attention to the fact that the space is on the smaller side. Though your space may be lacking in square footage, there is still plenty of wall space and height that can be used. Dealing with storage issues can be one of the most frustrating things about living in a small space. Many of these problems can be solved with the amount of available space on your walls. Try using bookshelves, and installing various hooks to hold things like bikes, or pots and pans. Lastly, don’t be afraid to think outside of the box when choosing furniture for a small space. In fact, it’s one of the best ways to ensure that you end up with a gorgeous space that fits your lifestyle. When curating furniture for your home it’s always important to think about how everything is going to function and work together. Having a guest room is probably not an option for someone who is pressed for space, so instead, try finding a decent sized pullout couch or a stylish futon for potential visitors. In the dining room, instead of a large table, why not install a floating bar? By doing this, you’re saving space and allowing a piece to serve many purposes.